Detroit, Michigan - Students examine a self-driving van on display at the Detroit Moves Mobility Festival. The van, made by May Mobility, is being used to move employees of Quicken Loans and affiliated companies from a parking garage to downtown Detroit offices. 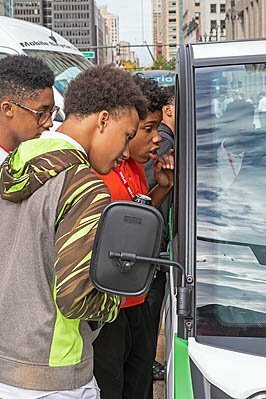 Image Description: Detroit, Michigan - Students examine a self-driving van on display at the Detroit Moves Mobility Festival. The van, made by May Mobility, is being used to move employees of Quicken Loans and affiliated companies from a parking garage to downtown Detroit offices.